Jay Clayton, vocals, Jerry Granelli, drums, Anthony Cox, bass and Julian Priester, trombone, performed in a special reunion concert at Cornish College Saturday night part of the Earshot Jazz Spring Series. Originally from Chicago, Julian Priester’s performing career is long and varied, beginning with stints in his teens playing with blues and R&B legends Muddy Waters, Dinah Washington, and Bo Diddley. In the early 1950s Priester was also a member of Sun Ra’s big band, and recorded several albums with that group before leaving Chicago in 1956 to tour with vibraphonist Lionel Hampton. Priester subsequently settled in New York, and between 1961 and 1969 appeared as a sideman on albums by Max Roach, Freddie Hubbard, Stanley Turrentine, Blue Mitchell, Art Blakey, Joe Henderson, John Coltrane, McCoy Tyner, Charles Mingus, Johnny Griffin, and Sam Rivers. In 1969 he accepted an offer to play with Duke Ellington’s big band, then left in 1970 to join pianist Herbie Hancock’s fusion sextet. 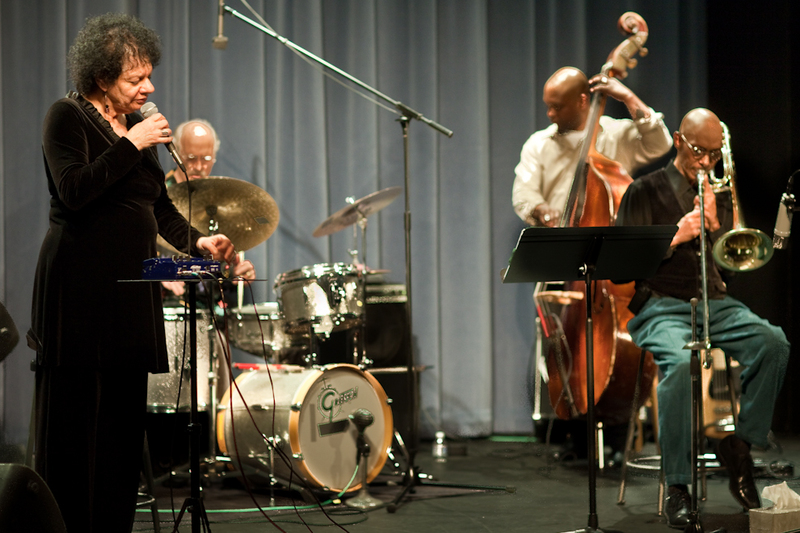 Since settling down in Seattle and joining the Cornish faculty in the late 1970s Priester has continued to perform as both a bandleader and sideman including tours with Sun Ra, Gary Peacock, the Dave Holland Quintet, Lester Bowie’s New York Organ Ensemble, and Charlie Haden’s Liberation Music Orchestra. His compositions have been recorded by Sun Ra, Ray Charles, Herbie Hancock, Philly Jo Jones, Lee Morgan, Max Roach, Abbey Lincoln, Clifford Jordan, and Dave Holland. His own music can be heard on the Riverside, ECM, and Conduit record labels. Jay Clayton has gained worldwide attention as both performer and teacher. She has appeared at major venues including Lincoln Center, Sweet Basil, Town Hall, the Kennedy Center, Jazz Alley, and the North Sea and Montmartre Festivals. She has taught at Universitat fur Musik in Austria, Bud Shank Jazz Workshop, and at City College and the New School in New York City. She co-taught with Sheila Jordan at the Vermont Jazz Workshop, and at the Banff Centre for the Arts in Canada, and was on the faculty of Cornish College of the Arts for twenty years. Her book Sing Your Story: a Practical Guide for Learning and Teaching the Art of Jazz Singing is published by Advance Music. Jay has performed and recorded throughout the U.S., Canada, and Europe with leading jazz and new music artists including Muhal Richard Abrams, Steve Reich, Stanley Cowell, Kirk Nurock, Gary Bartz, George Cables, and Jane Ira Bloom as well as with the a cappella group Vocal Summit comprised of Urszula Dudziak, Bobby McFerrin, Jeanne Lee, and Norma Winstone. Her current projects integrate poetry and electronics into her music. Her projects reflect the diversity of her art and her live performances, which range from duo to sextet, and are unique events that draw from all of these collaborations. Bassist Anthony Cox has recorded with Arthur Blythe, Dewey Redman, Geri Allen, Mike Cain, Uri Caine and many others. Halifax-based percussionist-composer Jerry Granelli grew up in San Francisco where he studied with Joe Morello and drummed for pianists Denny Zeitlin and Vince Guaraldi (on many a Charlie Brown television specials). He pioneered world jazz fusion and electro-acoustic percussion during the ‘60s, established the music department at Naropa Institute in Boulder, Colorado in the 1970s, and has taught continuously since then in Boulder, Seattle, Halifax and Berlin. In the early ‘80s he performed and recorded in a trio with Ralph Towner and Gary Peacock for ECM records. He has recorded as a leader for Evidence, Intuition, ITM, and the Koch labels, and performed and recorded with longtime musical associates Mose Allison, Jay Clayton, Jane Ira Bloom, Glen Moore, Anthony Cox, Dave Friedman, and Jamie Saft, as well as projects with Bill Frisell, Robben Ford, Julian Priester, Charlie Haden, Kenny Garrett, and Buck 64.